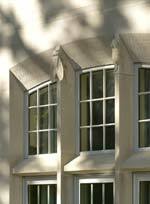 A new research facility fits harmoniously with neighboring historic campus structures. Editor’s note: While the Society for College and University Planning (SCUP) Convention meets July 19 through July 23 in Montreal, we thought it would be interesting to look at two new buildings designed with distinct architectural philosophies. Although there is the occasional new campus like UC Merced in California, most current campus buildings involve infill. The design of a new building to be inserted into an existing campus fabric is a natural window into the ongoing debate between proponents of architecture that follows historical precedents, and those who advocate design that seeks to distinguish itself from earlier built forms. Rather than simply reproducing this often highly abstracted debate, we take a more site-specific approach, looking at two recent examples where designers chose different architectural languages to engage neighboring academic antecedents. 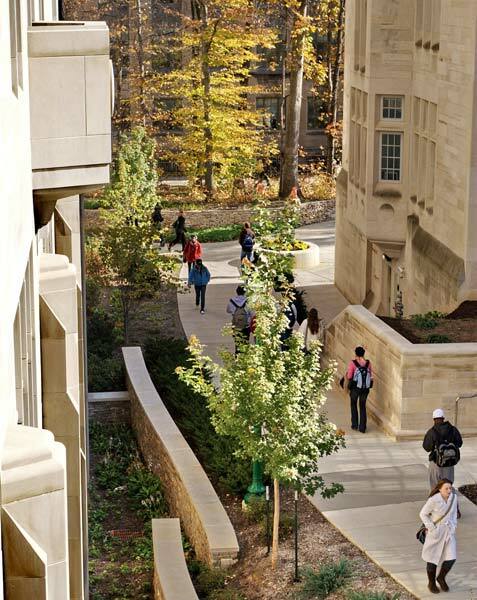 We begin with Flad’s new Simon Hall at Indiana University that looks for cues from the existing campus. In a few weeks we will check in at the University of Massachusetts, Amherst to explore a new nursing school by Anshen + Allen that responds to a 1940s-era building with a contemporary argument. Academic architecture invariably projects an identity about campus and community to building users and to the world beyond. Some institutions desire new buildings to be stand-alone statements, with ultramodern exteriors to symbolize the cutting-edge research to be conducted within. Yet in other cases, the architectural language established in surrounding precedents may be more appropriate, even for high-tech facilities. Simon Hall, a new $46.6 million interdisciplinary science building on the Indiana University campus, designed by Flad Architects of Madison, Wisconsin, inserts state-of-the-art research infrastructure in a building mass and exterior crafted to respond to their surroundings in the established vernacular of the historic Bloomington campus. 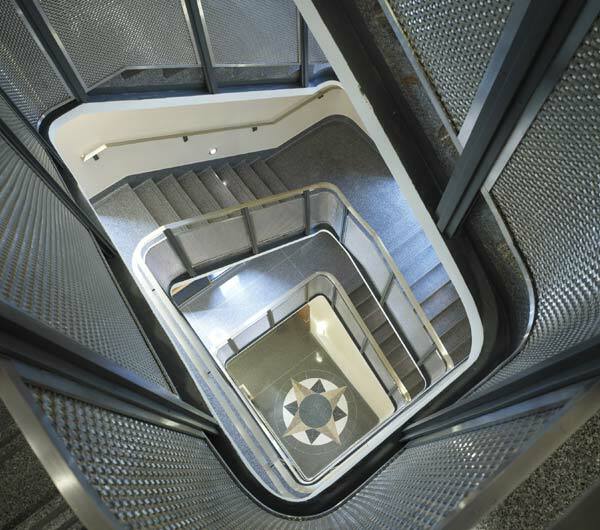 The interior of the 140,412-square-foot facility, dedicated in 2007, speaks to advanced scientific endeavor, featuring innovative spaces to support the realities of the collaborative research process. Yet the building exterior connects to its immediate location in Indiana University′s Old Crescent, an area on the southwestern corner of campus listed on the National Register of Historic Places, containing a cluster of nine landmark buildings dating to the late 19th and early 20th centuries, all finished in locally quarried limestone, a hallmark of Bloomington campus architecture. In the case of Indiana University, the prized campus fabric was itself the signature identity to be projected and affirmed. The campus community felt that an earlier experiment with a concrete building by I.M. Pei (1982) didn’t fit in with Bloomington’s limestone context. Project challenges for Simon Hall included fitting state-of-the-art research facilities into the existing picturesque context, deeply imbued with powerful architectural imagery. 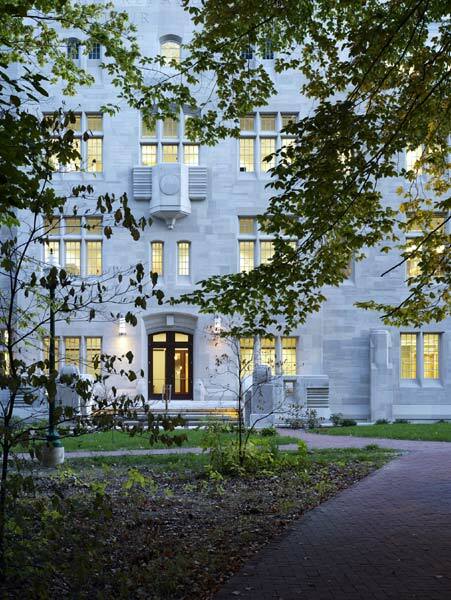 A more brazen building would have interrupted the local texture of the limestone-clad vertical elevations, meandering pathways, and extensive foliage. While interiors were programmed according to the needs of today′s interdisciplinary research, the exterior and mass avoid dissonance with Simon Hall′s surroundings, adjacent to a wooded expanse and completing a quadrangle with nearby historic structures. 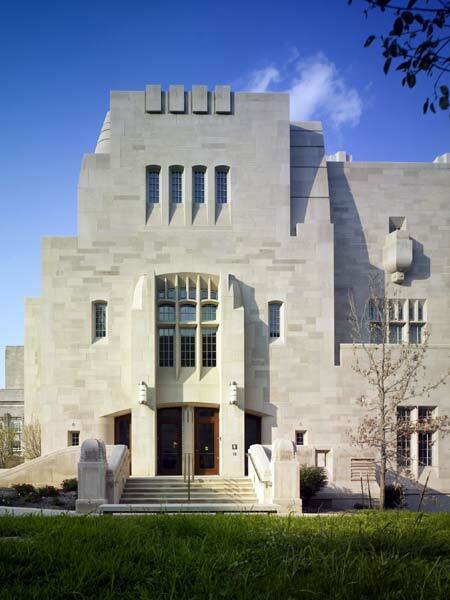 The concrete frame is finished in Indiana limestone, creating a wall that is over two feet thick and carved in the style of the neighboring neo-gothic and art moderne buildings. Figures of an E. Coli bacterium, a paramecium, maize, a fruit fly, and a mouse, all organisms with importance to the study of genetics, are sculpted into the façade. The scale of the new building was kept in harmony with neighboring historic structures by placing 65,000 square feet of floor space below grade. The green roof that covers this buried lab provides open space at ground level but is designed to allow daylighting to areas located below grade. 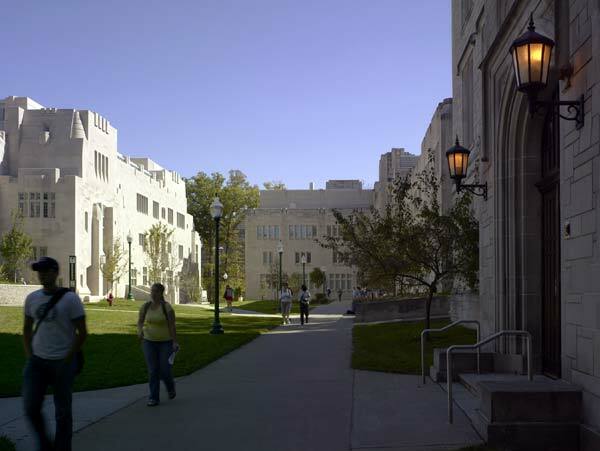 Subterranean tunnels also connect the building to the three nearby science facilities on the quad, ensuring easy interdisciplinary access to the new labs. The interior plan is rooted in extensive consulting with eventual building users, and in the architect′s ongoing comparative research into the design and use of existing scientific labs. Several design moves underpin Simon Hall′s intention to create an interdisciplinary and collaborative research facility. Notably, the interior plan provides space for more than just versatile labs and high-tech devices, but also for the social interactions among researchers and visitors that enrich the research process. 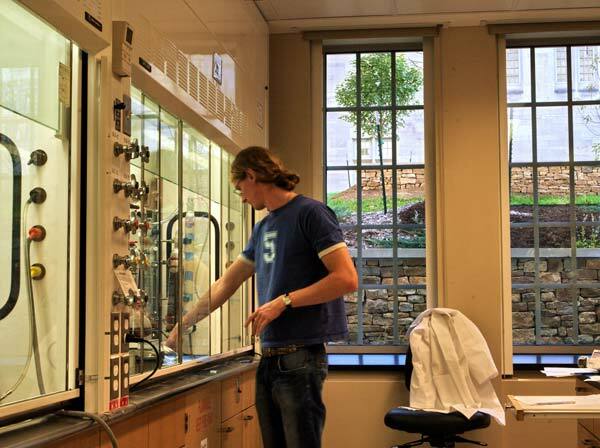 Simon Hall houses 45 laboratories in three styles (low-hood intensive laboratories, high-hood intensive laboratories, and instrumentation laboratories) in 78% of its assignable area, as well as administrative, office, and lab support spaces. 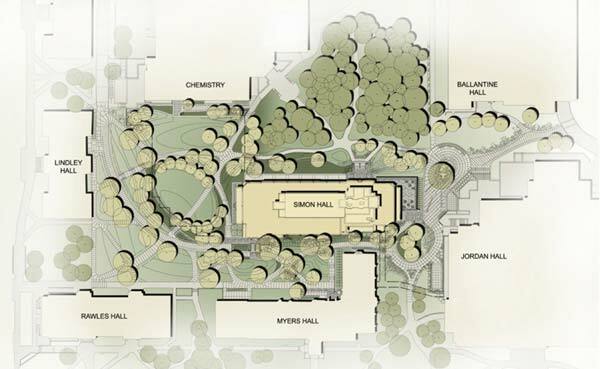 No single discipline claims ownership over the new facility; instead Simon Hall is to be a resource for Indiana researchers in such fields as cell biology, microbiology, molecular biology, genetics, analytical chemistry and biochemistry, and biophysics. To meet the needs of interdisciplinary research, the modular and flexible labs can be quickly reconfigured to accommodate users from various backgrounds, while mechanical systems are designed to be adaptable to new machinery as building use evolves in the coming decades. High-tech equipment includes a high field nuclear magnetic resonance facility, a clean room for nanofabrication, a cryo-electric microscope, a bio-safety level 3 facility used for virology and bacteriology, and an X-ray crystallography suite. Flad′s own research on laboratory buildings found that the layout of non-research spaces can actually shape the productivity of those conducting research in a site. Plans with centrally located non-laboratory spaces provide nodes for informal interaction between building users, creating community and facilitating academic dialogue. In collaborative research environments, Flad found that project teams frequently make use of common spaces in buildings for problem-solving and coordination. As such, Simon Hall has spaces designed for both formal and informal interaction, treating the social connections between researchers as a vital part of the research infrastructure. 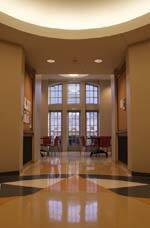 Impromptu meeting spaces are incorporated near stairwells, while a conference center provides a more formal meeting area along with a catering kitchen for staging light food services. 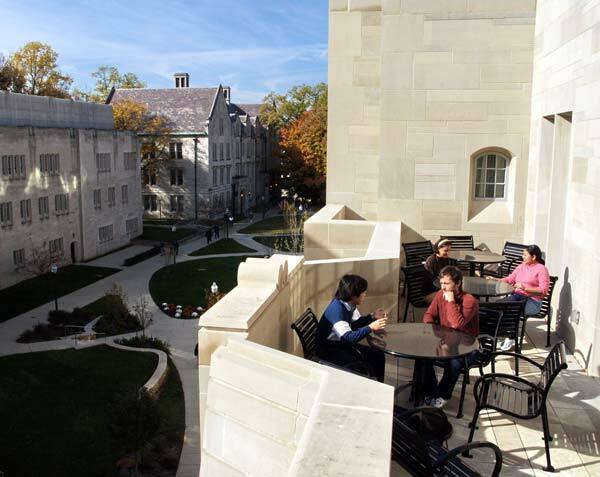 One design element that grew out of consultation with Indiana researchers was the placement of balconies near the labs, for taking in fresh air and short breaks during the long hours required at the lab in the research process. 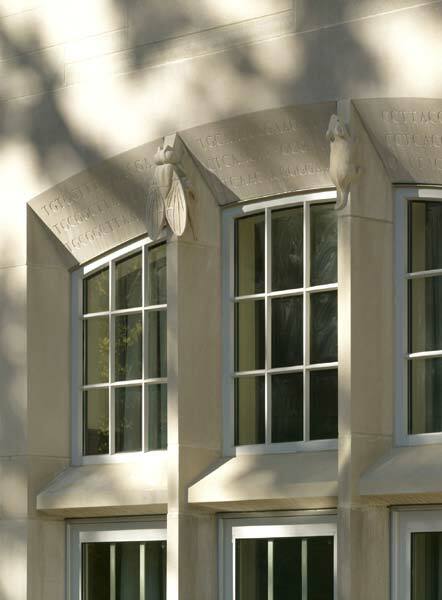 Finished in limestone, the balconies tie in with the language of the building exterior and that of Myers Hall, a 1930s art moderne science building next door. Extensive use of glass interior walls enhances informal and planned interaction between research colleagues. This transparency also allows a high level of visibility to the scientific research practiced within, providing an outreach tool to visitors from the business community. The new facility houses the Biocomplexity Institute and the Center for Genomics and Bioinformatics, along with the Linda and Jack Gill Center for Biomolecular Science and the Johnson Center for Entrepreneurship & Science Innovation, part of the Kelly School of Business, whose purpose is to link science emerging from the laboratories with business opportunities. 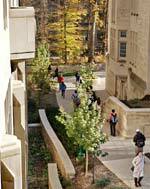 As David Black, AIA, design principal for Flad Architects, says, "You don′t walk up to Simon Hall and say that it′s a Flad building, or a David Black building; you say ′I′m at Indiana University.′" By inserting state-of-the-art technical facilities into a building envelope that responds to its architectural precedents, Simon Hall projects an image of both innovation and historical continuity for Indiana University science. Gregory Hoadley is a writer based in the San Francisco Bay Area. 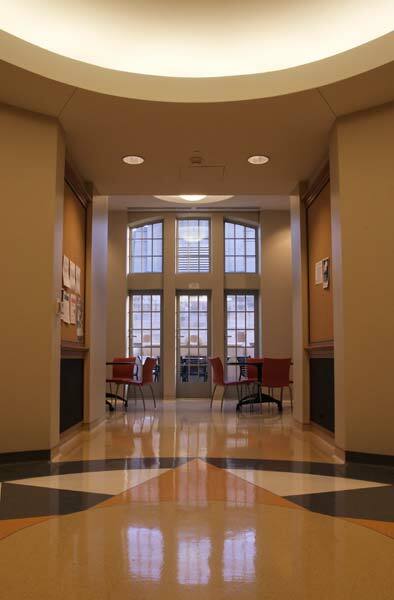 Architect: Flad Architects, Madison, Wis.
Flad Architects specializes in the planning and design of facilities for academic, healthcare, and science and technology clients worldwide. Flad′s staff of 300 professionals work from full-service offices in Madison, WI; Gainesville and Tampa, FL; Stamford, CT; San Francisco, CA; Raleigh, NC; and Atlanta, GA. Over the years, the firm′s projects have earned numerous awards for design excellence, including 7 Lab of the Year honors. Virtually all offices, labs, and common areas have access to views and natural light.